While doing the press round for imminent Civil War drama Free State of Jones, Matthew McConaughey revealed that he has held talks with True Detective creator Nic Pizzolatto about potentially reprising the enigmatic role of Rust Cohle. Appearing on The Rich Elsen Show, the Oscar-winner cautioned that such a return to one of his best-loved roles would need to be handled in “the right way” as opposed to shoehorned in for the sake of fan service. 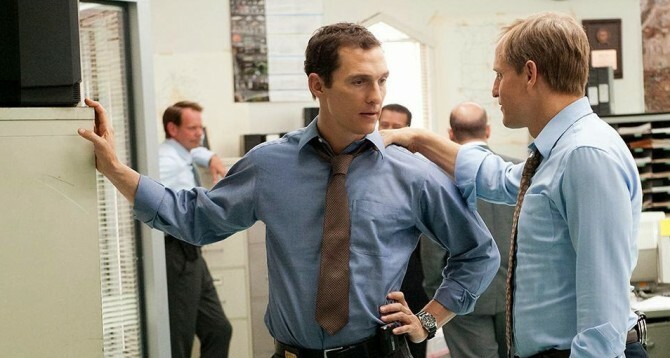 Starring opposite Woody Harrelson’s fellow law enforcer in the blistering first season, Matthew McConaughey drew unanimous praise for his turn as the brooding, existential detective. Without question, both McConaughey and Harrelson set the bar of quality very high by the time the credits rolled on True Detective – performances that Colin Farrell, Vince Vaughn et al. struggled to emulate in the show’s sophomore outing. Last we reported on True Detective, HBO had effectively placed the brooding procedural on ice, allowing Nic Pizzolatto to shift his attention to another show at the network. At least for now, the jury’s still out on whether the series can carve out a future after the lowly reception of season 2. Matthew McConaughey can be seen spearheading the Free State of Jones when Gary Ross’ period piece opens tomorrow, June 24.